I do this mostly for stocks, but started doing it for bitcoin a bit ago out of fun/curiosity. I am pretty happy with how well it has turned out so far. It takes a bit to load. It's a lot of data and I am not the best front-end dev, nor do I know someone who is. Expect to wait about a minute for it to load the actual chart. It is the price on top, sentiment analysis on bottom. With bitcoin, a lot of times you'll see price actually lead sentiment. With stocks, as well as what appears to be with bitcoin, many of the price reductions are called in advance by sentiment, where the rises are usually lead by price...or insiders. Awesome, you should keep going! 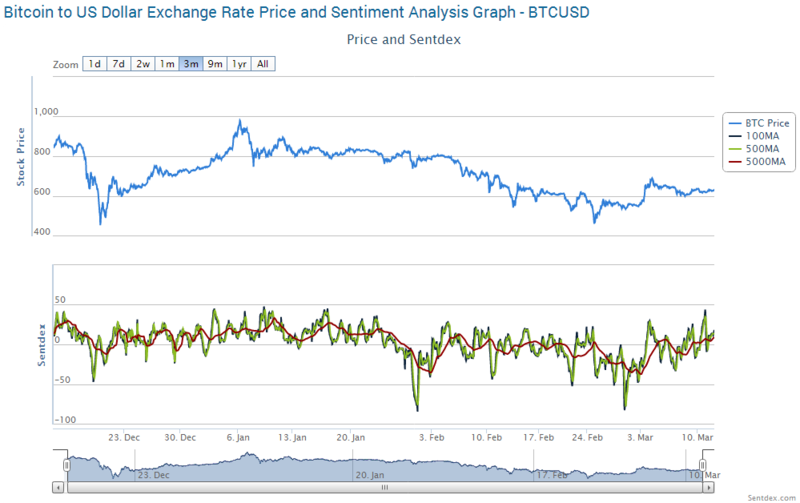 I've only seen one other sentiment analysis of bitcoin so far, boring market! I also use python, though I don't use NLTK. I learned python with the NLTK book though. I knew I wanted to do this with stocks, and didn't know which language to use. I eventually had a friend show me that book so python became the language. Yeah it loads slow but it is really cool. erm.. I want to see a correlation but I only see an idea?.. Certainly this field will be further explored in the coming months/years. I also did it just out of curiosity. I'm not a trader, just a webdev with some python background, but I clearly see room for profit here. I mean, you just have to look to Google trends to see that 'bitcoin interest' = 'market response'. Haha, yep. Some of the best indicators are the simplest. That one is good, I also measure chatter amount on Twitter and Stocktwits on bitcoin. It doesn't seem to matter too much what the chatter is, barring very bad events like Gox. If there's a lot of discussion price is going up, at least so far. Eventually that will change once it is mainstream. For now, all press is good press, seems to be spreading curiosity for bitcoin. I know that's what brought me in.